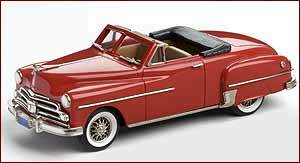 1950 Dodge Wayfarer sport roadster finished in cadet red by Brooklin Models. At the beginning of the 1960s Chrysler Corporation were not noted for exciting motor cars. Although things would change rapidly by the middle of the decade, one of the few offerings from any of the divisions that could raise a smile was the little Dodge Wayfarer. 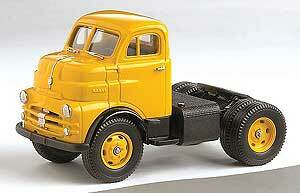 Yellow version of this famous 1953 Dodge Truck. The short turning radius of these C.O.E. (cab-over-engine) models made for easier handling at docks, in narrow streets and for curb parking. The cabs were full width, roomy and comfortable with no projecting housing above the floor to crowd the driver.